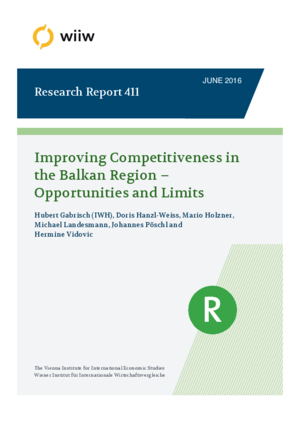 The aim of this study is to analyse the state of the competitiveness of seven Western Balkan economies and to suggest policy recommendations in order to increase their capacity to compete. Most countries from the Western Balkans have a persistent current account deficit of about 10% of GDP which indicates their substantial lack of competitiveness. Also their goods export share makes only about 20% of GDP while it is around 70% for the new EU member states in Central Europe. Contrary to their northern neighbours, the Western Balkan countries have specialised in low and low-medium tech industries and have only little higher-tech products e.g. from the machinery and automotive or chemical industry to offer on the international markets. Several of these countries are excluded from international production networks. The quality of the institutions in the Western Balkans is weak but improving with further steps in the European integration process; the EU acts as an anchor of institutional stability. There are still considerable administrative and technical barriers to trade. Public transport infrastructure is more often than not in a very bad shape. Most of these countries are excluded from the international transport networks. Also the human capital could be improved. Unemployment is extremely high and large parts of the population are stuck in subsistence farming or are migrating. The labour market has problems to absorb the idle labour force. Financing is clearly a major restriction for an increase in much needed productive capacities. Real interest rates are high, the share of non-performing loans is large and credit growth is weak. A number of policy recommendations are made. Most of the countries need strong investment in transport infrastructure, both to connect internally as well as to connect across borders. Some also need substantial investment in their ailing energy infrastructure. Additional support for foreign direct investment could quickly generate new production capacities and transfer of technology. Given that most of the Western Balkan economies have either unilaterally adopted the euro or have pegged their currency to the euro, monetary and exchange rate policy is not available as a tool to foster competitiveness. An alternative option would be to support social partnership and a cooperative incomes policy that aims to orientate itself at full employment, productivity gains and inflation. For some of the more developed economies, investment into a dual system of vocational education could be costly but beneficial. Lower priced measures that in part could also be implemented more quickly include the following policies: An administrative reform should aim at increasing the absorption capacities of EU support funds in order to identify and co-finance the most advantageous projects. A quick solution of the dragging issue of non-performing loans could cause a much needed improvement in credit activity. A measure that could be implemented in a budgetary neutral way is a fiscal devaluation, whereby an increase of the value added tax and a reduction of the employer’s social security contribution could have the same competitiveness improving effects as a nominal exchange rate devaluation.